Just over a half-century ago, Petula Clark had a hit song called “Downtown,” whose ending stanza was, “everything’s waiting for you” there. Alas, for several decades after the release of the tune, that sentiment rang hollow, as suburbs flourished and many Central Business Districts (CBDs) became ghost towns after office hours. But that has changed in recent years, as a residential renaissance (accompanied by a resurgence of such amenities as eateries, entertainment, and shopping) has taken hold in the cores of numerous metropolises, including Cincinnati. Helping drive that trend: Millennials who want to be close to work and play, and empty-nester baby boomers looking to downsize and put the mower into mothballs. Some numbers compiled by Downtown Cincinnati Inc. (DCI) help tell the tale locally. From 2016–2018, 1,169 new residential units were completed in the CBD, with another 544 such units under construction. The occupancy of the existing units has remained high, at 93 percent. Taking a page from the design-centric focus of boutique hotels, this 294-unit project features an opulent look in both its public spaces and residences. Housed in an 11-story office building that originally opened in 1928 as an annex to the PNC Tower at 4th and Vine Streets, this $67 million development — by City Club Apartments, an operator of about two dozen complexes throughout the Midwest — offers 50 distinct floor plans with hardwood and ceramic floors, 10- to 18- foot ceilings, European-style kitchens and three different finish packages. Its on-site amenities include an indoor/outdoor pool (featuring a glass garage door that can be opened when the weather is warmer), fire pit, Zen garden, and rooftop restaurant and bar. "Like all of our developments, the City Club Apartments in Cincinnati were built on a foundation of five guiding principles -- customer centric; design driven; unparalleled amenities and services; green and social responsibility; and advanced technologies," says Jonathan Holtzman, co-founder, chairman and CEO of City Club Apartments LLC, which has offices in Detroit, Chicago and Toronto. "City Club Apartments reflect the design and service of the world’s finest boutique and five star hotels, and are the epitome of distinctive urban apartment living." The project’s design team includes three firms that have worked on a variety of high-profile downtown living projects nationwide: BKV Group, Damon Farber Associates, and Village Green Interiors. Those firms intermixed the building’s state-of-the-art features with a variety of elements that harken back to its founding era, including a restored gold leaf ceiling in its main entrance, art deco lighting fixtures, and black and white ceramic tiling. This 104-year-old building first housed the Crane Hawley Factory, a maker of plumbing fixtures, and then the Hamilton County Board of Elections before its recent move to Norwood. It’s now home to 69 rental units with open-concept floor plans offering wood plank-style vinyl floors, loft ceilings, custom closets, quartz countertops, stainless-steel appliances, and ceramic-tiled showers. Serving as architect for the project was GBBN, and its designer was Meg Keim Interiors. “Our goal was to create a unique yet luxury living experience in an historic building within the downtown design district,” says Mark Kanter, vice president of Rookwood Properties, which developed the complex. As with most other downtown residential projects, creating a sense of community is also an important element within the complex, with features such as a communal lounge, a game room, a fitness and yoga room, and a pet-washing station. And, of course, a must-have amenity for today’s online-obsessed shoppers — Amazon package delivery lockers. These high-end condos are ensconced in a structure that was originally home to the Rybolt Heating and Cooling Co. 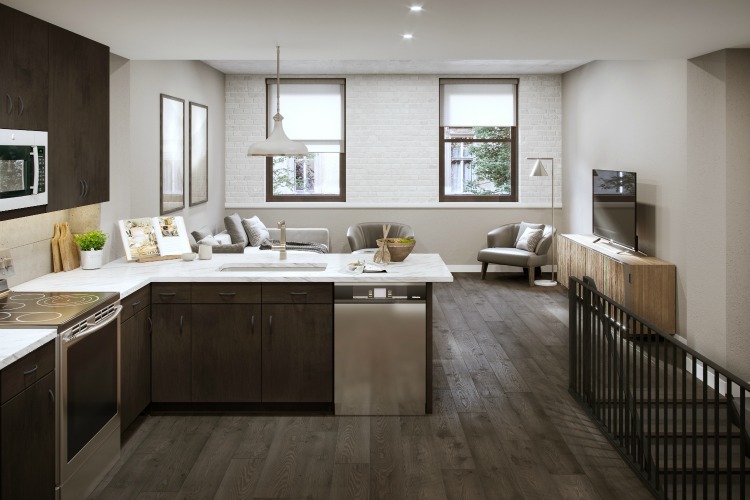 Developer Pearl Cos. transformed the Italianate-style building into a 16-unit condominium complex that celebrates the structure’s grittier past with swatches of exposed brick and timber beams, while offering such state-of-the-art residential touches as high-gloss cabinets, quartz countertops, and chrome kitchen and bath fixtures. In addition, the units offer plentiful natural light via eight-foot-tall windows, and ceilings range from 12 to 15 feet tall for a spacious feel. “This luxury property is made up mostly of one-bedroom units that target millennials and others looking for high-end finishes and an authentic feel,” says Scott Oyler of Oyler Group at Coldwell Banker West Shell, the property’s leasing agent. The above three projects are known in development and design circles as adaptive reuses — that is, the conversion of an existing building from one purpose to another. But downtown Cincinnati has also seen several new-build residential projects, most notably the Current and Radius buildings in The Banks district adjacent to the Ohio River. However, another newcomer is also on the scene on the northeast side of the CBD, in the form of 133-unit Encore Urban Living. That 17-story tower at Sycamore and Eighth — so named because it involves general contractor Al Neyer and John Senhauser Architects, both who also worked on the nearby Seven at Broadway apartments — features roomy rental units (typically about 1,100 square feet), six finish packages, and custom closets. “Because this is a new-build, we were really able to customize it to fit the demands of the market,” says Nick Rabin, asset manager for multifamily for North American Properties, with teamed with NorthPointe Group to develop the $52 million project. The building’s backers also wanted the tower’s exterior to make a strong visual statement. As a result, they had the building clad with Kolorshift, an iridescent architectural coating that changes hues with varying angles of light. So, when it comes to the upcoming tour of the projects detailed above, and their 10 sister complexes, who should go? “Anyone who’s interested in urban living, or those who appreciate historic architecture and adaptive reuse projects, as well as brand-new residential developments in the core,” says Cate Douglas, research and business outreach manager at DCI, which is running the tour in conjunction with Switch Collection. Tickets for the tour are $10 before October 13, and $15 the day of the event. To buy advance tickets, visit Downtown Tour of Living.